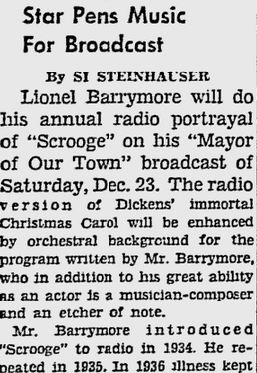 Another staple of the radio era was a production of “A Christmas Carol” starring Lionel Barrymore as Ebenezer Scrooge. From Christmas Eve, 1939, courtesy of Archive.org. This entry was posted in 1939, Hollywood, Radio and tagged #Christmas, 1939, OTR, radio. Bookmark the permalink. Orson Welles actually directed Lionel Barrymore in the radio version. Mr. Barrymore had a long presence in the medium. I remember when he was the host of Lux Radio Theater and his passing was announced. Wow. Thanks for posting this. My grandfather had a 33 rpm recording of Lionel Barrymore doing Scrooge in “A Christmas Carol.” We used to listen to it every Christmas. It was a holiday tradition. To this day, Alistair Sim and Lionel Barrymore are my two favorite Scrooges.